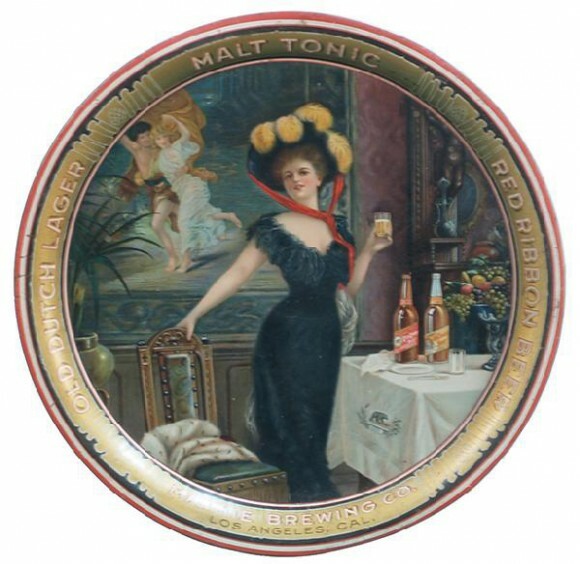 Serving Tray for Red Ribbon Beer & Old Dutch Lager from The Mathie Brewing Company out of Los Angeles, California. The image on this tray has great detail and color, a real find for anyone collecting Victorian ladies. This tray dates to pre-prohibition and is a 13″ inverted pie. The border has a great design that looks like a ribbon going all the way around the tray with hop motifs at the corners with bunching ribbon. No manufacturer’s information on the tray that I have been able to locate.